Description: Copperweld Steel Co. 2 from Warren Ohio acquired by the Moshassuck Valley in 1962. Pictured at Copperweld Steel, Moshassuck Valley No 9 being readied for its trip to Lincoln, Rhode Island. Description: GE 400 HP 65-ton industrial model puurchased in 1962 from Copperweld Steel Co. of Warren, Ohio. (ex No. 2 of Copperweld). When the Providence & Worcester purchased the MVRR in 1981, No. 9 became P&W/Warwick 106 and in 1988 it was sold to Pennsylvania Power & Light. 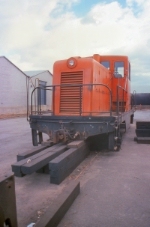 Description: MVRR 9 - 400 HP 65 tonner -- Durastone Plant is behind No.9. 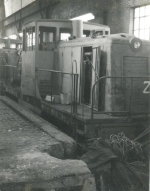 Description: MVRR 9 in the enginehouse while No. 8 does the day's work. Description: No 9 purchased for the heavier cars going to Collyer Wire. 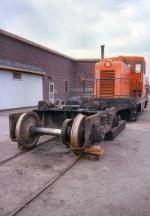 The No 8 a 45 tonner only has 1 traction motor per truck connected with a chain. They'ed service the No 8's oil reservoirs right about here with a Vermont Maid maple syrup bottle filled with chain oil. Description: I was brought up with this railroad! I never seen this many new ties around! Description: With Watt Terminal in the background, No 9 was getting its wheels changed the way they do it on short lines! Description: These 2 photos show the simplicity of the GE truck! Description: Warwick Railway purchased by the Providence and Worcester. The o'l No 9 was painted green and worked the Warwick Railway for awhile. 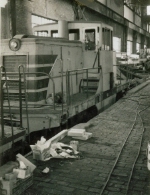 Seen here in 1984 dismantling the old New Haven Northup Avenue Yard at Silver Spring Street in Providence, Rhode Island.